The cooler months are here and you can finally stop worrying about having to mow your grass. Trimming up hedges and bushes will also slow down. It’s time to start thinking about any large additions you want to make. Adding trees can be a big decision, so our Hutcheson Team came up with three trees that they all enjoy! Most of you have probably heard of Flowering Dogwood from hole 11 at the Augusta National Golf Club. On the course it’s known as White Dogwood, which is an older name that isn’t as common anymore. Flowering Dogwood trees are a smaller deciduous tree that can grow around 33 feet high. Their flowers are an important food source for many birds, which can bring some beautiful natural wildlife to your home. There are so many different kinds of Crape Myrtles that it’s hard to know where to begin. However, this tree will literally take coloring your yard to a new level. Crape Myrtles are a flowering tree that bloom in summer and fall and will pair nicely with short flowers planted in the ground. 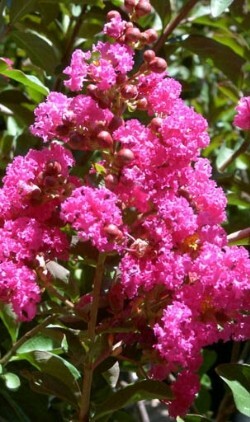 A few of our favorites are Muskogee Crape Myrtle, Natchez Crape Myrtle, and the Tuscarora Crape Myrtle. The Red Maple is one of the most popular trees on the eastern side of America. It offers shade in the summer and bright leaf changes in the fall. If you can accept raking a few leaf piles in the fall this is the perfect tree for your yard.